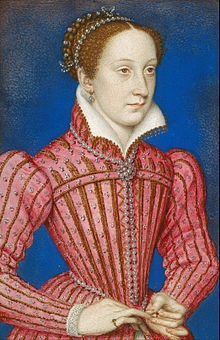 Mary, Queen of Scots (8 December 1542 – 8 February 1587), also known as Mary Stuart or Mary I of Scotland, reigned over Scotland from 14 December 1542 to 24 July 1567. Mary, the only surviving legitimate child of King James V, was six days old when her father died and she acceded to the throne. 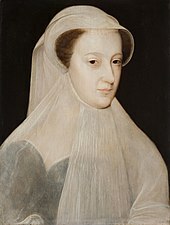 She spent most of her childhood in France while Scotland was ruled by regents, and in 1558, she married the Dauphin of France, Francis. He ascended the French throne as King Francis II in 1559, and Mary briefly became queen consort of France, until his death in December 1560. Widowed, Mary returned to Scotland, arriving in Leith on 19 August 1561. 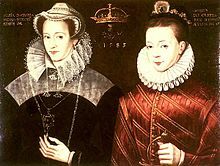 Four years later, she married her first cousin, Henry Stuart, Lord Darnley and in June 1566 they had a son, James. King Henry VIII of England took the opportunity of the regency to propose marriage between Mary and his own son and heir, Edward, hoping for a union of Scotland and England. 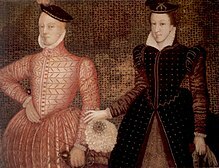 On 1 July 1543, when Mary was six months old, the Treaty of Greenwich was signed, which promised that, at the age of ten, Mary would marry Edward and move to England, where Henry could oversee her upbringing. 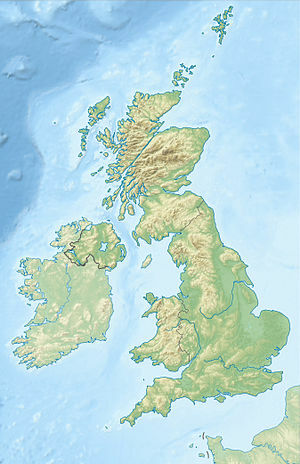 The treaty provided that the two countries would remain legally separate and that if the couple should fail to have children the temporary union would dissolve. Cardinal Beaton rose to power again and began to push a pro-Catholic pro-French agenda, which angered Henry, who wanted to break the Scottish alliance with France. Beaton wanted to move Mary away from the coast to the safety of Stirling Castle. Regent Arran resisted the move, but backed down when Beaton's armed supporters gathered at Linlithgow. 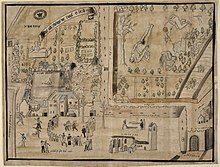 The Earl of Lennox escorted Mary and her mother to Stirling on 27 July 1543 with 3,500 armed men. Mary was crowned in the castle chapel on 9 September 1543, with "such solemnity as they do use in this country, which is not very costly" according to the report of Ralph Sadler and Henry Ray. 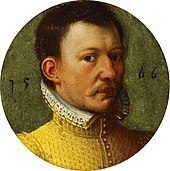 Originally Mary believed that many nobles supported her marriage, but things soon turned sour between the newly elevated Bothwell (created Duke of Orkney) and his former peers, and the marriage proved to be deeply unpopular. 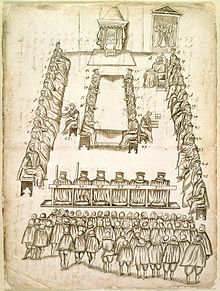 Catholics considered the marriage unlawful, since they did not recognise Bothwell's divorce or the validity of the Protestant service. Both Protestants and Catholics were shocked that Mary should marry the man accused of murdering her husband. The marriage was tempestuous, and Mary became despondent. Twenty-six Scottish peers, known as the confederate lords, turned against Mary and Bothwell, raising an army against them. 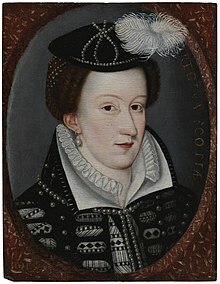 Mary and Bothwell confronted the lords at Carberry Hill on 15 June, but there was no battle as Mary's forces dwindled away through desertion during negotiations. Bothwell was given safe passage from the field, and the lords took Mary to Edinburgh, where crowds of spectators denounced her as an adulteress and murderer. The following night, she was imprisoned in Loch Leven Castle, on an island in the middle of Loch Leven. Between 20 and 23 July, Mary miscarried twins. On 24 July, she was forced to abdicate in favour of her one-year-old son James. Moray was made regent, while Bothwell was driven into exile. He was imprisoned in Denmark, became insane and died in 1578. 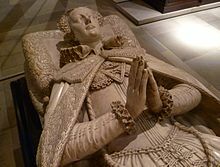 On 26 January 1569, Mary was moved to Tutbury Castle and placed in the custody of the Earl of Shrewsbury and his formidable wife Bess of Hardwick. 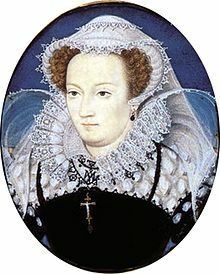 Elizabeth considered Mary's designs on the English throne to be a serious threat and so confined her to Shrewsbury's properties, including Tutbury, Sheffield Castle, Wingfield Manor and Chatsworth House, all located in the interior of England halfway between Scotland and London, and distant from the sea. Mary was permitted her own domestic staff, which never numbered fewer than sixteen, and needed thirty carts to transport her belongings from house to house. Her chambers were decorated with fine tapestries and carpets as well as her cloth of state on which she had the French phrase En ma fin est mon commencement ("In my end lies my beginning") embroidered. Her bedlinen was changed daily, and her own chefs prepared meals with a choice of thirty-two dishes served on silver plates. She was occasionally allowed outside under strict supervision, spent seven summers at the spa town of Buxton, and spent much of her time doing embroidery. Her health declined, perhaps through porphyria or lack of exercise, and by the 1580s she had severe rheumatism in her limbs, rendering her lame. Mary was not beheaded with a single strike. The first blow missed her neck and struck the back of her head. The second blow severed the neck, except for a small bit of sinew, which the executioner cut through using the axe. Afterwards, he held her head aloft and declared, "God save the Queen." At that moment, the auburn tresses in his hand turned out to be a wig and the head fell to the ground, revealing that Mary had very short, grey hair. Cecil's nephew, who was present at the execution, reported to his uncle that after her death "Her lippes stirred up and downe a quarter of an hower after her head was cut off" and that a small dog owned by the queen emerged from hiding among her skirts—though eye-witness Emanuel Tomascon does not include those details in his "exhaustive report". Items supposedly worn or carried by Mary at her execution are of doubtful provenance; contemporary accounts state that all her clothing, the block, and everything touched by her blood was burnt in the fireplace of the Great Hall to obstruct relic-hunters. ↑ Guy 2004, pp. 41–42; "St Mauris to the Queen Dowager", 25 August 1548, quoted in Hume, Martin A. S.; Tyler, Royall, eds. (1912). "Appendix: Miscellaneous 1548". Calendar of State Papers, Spain: Volume IX: 1547–1549. London: Her Majesty's Stationery Office. p. 577. ; Lord Guthrie (1907). "Mary Stuart and Roscoff" (PDF). Proceedings of the Society of Antiquaries of Scotland. 42: 13–18. ↑ Anonymous (1558). Discours du grand et magnifique triumphe faict au mariage du tresnoble & magnifique Prince Francois de Valois Roy Dauphin, filz aisné du tres-chrestien Roy de France Henry II du nom & de treshaulte & vertueuse Princesse madame Marie d'Estreuart Roine d'Escosse (in French). Paris: Annet Briere. ↑ Teulet, Alexandre (1862). Relations politiques de la France et de l'Espagne avec l'Écosse au XVIe siècle (in French). 1. Paris: Renouard. pp. 302–311. ↑ Thompson, James (1909). The Wars of Religion in France. Chicago: University of Chicago Press. p. 22. ISBN 978-1-4179-7435-1. ↑ Thomson, George Malcolm (1967). The Crime of Mary Stuart. London: Hutchinson. pp. 148–153, 159–165. ISBN 978-0-09-081730-6. ↑ Mary, Queen of Scots. "A catte". Royal Collection Trust. Inventory no. 28224. 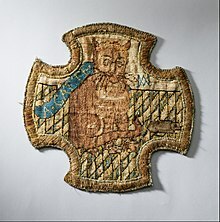 ↑ Embroideries by Mary are also kept in the Victoria and Albert Museum (Marian Hanning, Oxburgh Hangings) and Hardwick Hall. ↑ Tomascon, Emanuel (1924). "79. Execution of Mary Stuart". In von Klarwill, Victor. The Fugger Newsletters. London: John Lane The Bodley Head. pp. 97–105. ↑ Hutchinson, Robert (2006). Elizabeth's Spy Master: Francis Walsingham and the secret war that saved England. London: Weidenfeld & Nicolson. pp. 196–201. ISBN 978-0-297-84613-0.